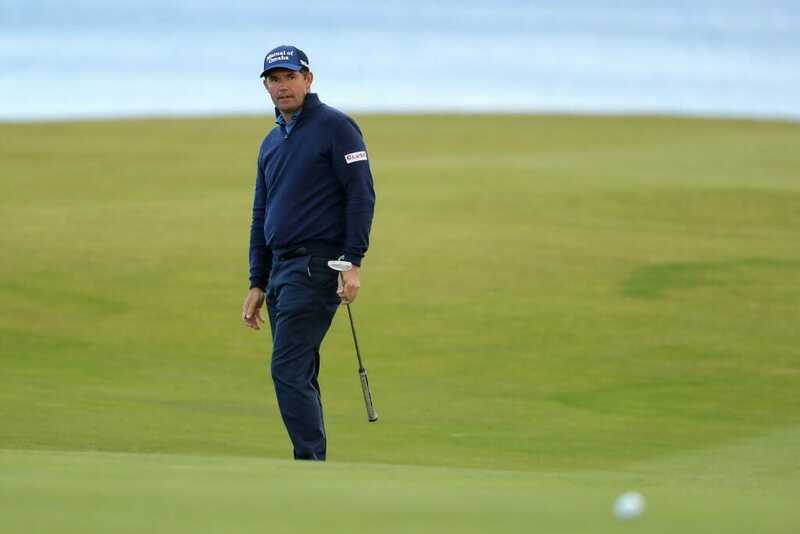 Padraig Harrington and his fellow final round Alfred Dunhill Links Championship competitors are facing the bizarre scenario of a ‘shotgun’ start to the final round at St. Andrews in Scotland. Harrington, the lone Irishman to make the Scottish cut, posted a three-under par 69 to move to a share of 20th place at six-under par on the Old Course. England’s Tyrrell Hatton snatched two eagles in his round of 66 also on the Old Course to lead the on 14-under par and is now carrying the added weight of striving to capture the tournament for a third year in succession. Aussie Marcus Fraser reduced Hatton’s then three-shot lead at the end of the victorious Ryder Cup stars round to one with the Melbourne-based Fraser birding his closing two holes at Kingsbarns Links. However, the forecast of up to 40mph winds just after lunch on Sunday has forced officials into the extreme measure of adopting a ‘shotgun’ start teeing-off at 8.30am and with Hatton and Fraser playing from the first hole of the Old Course. European Tour officials working in Scotland had no knowledge if any round in recent Tour history has been played under a ‘shotgun start’, a format that is traditionally used in playing a pro-am. Sixty players made the cut and with a total of 87, including amateurs, teeing off between 8.30am and 8.40am. Harrington capped his round at the par-5 fifth hole hitting a 255-yard 4-iron second shot to 30-feet and rolling in the putt while he delighted in ending his round holing a five-footer for birdie on 18. “It’s always nice to birdie any last hole in any tournament you play but then it’s that little bit extra when it is at the Old Course,” he said. “The eagle on five was also good but I just missed so many chances out there including three-putting three holes at nine, 12 and 14 and though they were long-range and never guaranteed birdies, those three shots could have made all the difference from being an average round to being a very good round. “We now have a really early start tomorrow and for me it’s going to start around half-five or maybe earlier. Indeed, Harrington got his wish with the final round later being released to show him to be teeing-off at the 15th hole and ending at the 14th. Harrington then watched from the behind the 18th green as Paul McGinley drove his tee shot up the last to within yards of the green only for McGinley to walk off disappointed with a par in his round of 75 for a one-over par tally. “I could have done with the wind staying-up over the last two days as I played superb on Thursday in the cross-winds at Kingsbarns and only just falling short of sharing the first-round lead,” he said. Also missing the cut was Robin Dawson (214 – 74, 70, 70), Michael Hoey (217 – 74, 72, 71), Shane Lowry (218 – 72, 75, 71) and Graeme McDowell (223 – 77, 72, 74).